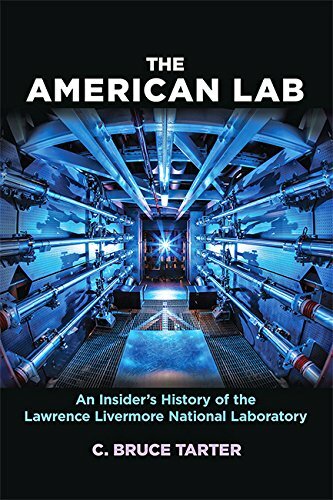 The American Lab: An Insider’s History of the Lawrence Livermore National Laboratory (Johns Hopkins Nuclear History and Contemporary Affairs) est le grand livre que vous voulez. Ce beau livre est créé par C. Bruce Tarter. En fait, le livre a 472 pages. The The American Lab: An Insider’s History of the Lawrence Livermore National Laboratory (Johns Hopkins Nuclear History and Contemporary Affairs) est libéré par la fabrication de Johns Hopkins University Press. Vous pouvez consulter en ligne avec The American Lab: An Insider’s History of the Lawrence Livermore National Laboratory (Johns Hopkins Nuclear History and Contemporary Affairs) étape facile. Toutefois, si vous désirez garder pour ordinateur portable, vous pouvez The American Lab: An Insider’s History of the Lawrence Livermore National Laboratory (Johns Hopkins Nuclear History and Contemporary Affairs) sauver maintenant. Nobel laureate Ernest O. Lawrence and renowned physicist Edward Teller founded the Lawrence Livermore National Laboratory in 1952. A new ideas incubator, the Lab was at the heart of nuclear testing and the development of supercomputers, lasers, and other major technological innovations of the second half of the twentieth century. Many of its leaders became prominent figures in the technical and defense establishments, and by the end of the 1960s, Livermore was the peer of Los Alamos National Lab, a relationship that continues today. In The American Lab, former Livermore director C. Bruce Tarter offers unparalleled access to the inner workings of the Lab. Touching on Cold War nuclear science and the technological shift that occurred after the fall of the Berlin Wall, he traces the Lab’s evolution from its founding under University of California management through its transfer to private oversight. Along the way, he highlights important episodes in that journey, from the invention of Polaris, the first submarine-launched ballistic missile, to the Lab’s controversial role in the Star Wars program. He also describes Livermore’s significant responsibilities in stockpile stewardship, the program that ensures the safety and reliability of the US nuclear arsenal. The book portrays the lab’s extensive work on thermonuclear fusion, a potential source of unlimited energy; describes the development of the world’s largest laser fusion installation, the National Ignition Facility; and examines a number of smaller projects, such as the Lab’s participation in founding the Human Genome Project. Finally, it traces the relationship of the Lab to its federal sponsor, the Department of Energy, as it evolved from partnership to compliance with orders, a shift that affected all of the national laboratories. Drawing on oral histories, internal laboratory documents, and the author’s personal experiences from more than fifty years as a Lab employee, The American Lab is an illuminating history of the Lab and its revolutionary work.